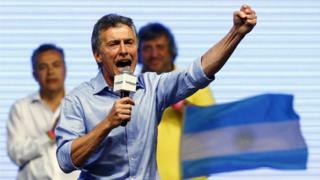 Image caption Mauricio Macri said his victory marked "the changing of an era"
First, right-wing candidate Mauricio Macri won the presidential contest in Argentina. Then, in early December, the centre-right opposition Democratic Unity Roundtable (MUD) coalition swept to victory in elections for the National Assembly in Venezuela. Meanwhile, in Brazil, President Dilma Rousseff, of the left-wing Workers' Party (PT), faces possible impeachment. And even if this comes to nothing, local observers think it unlikely she will reach the end of her mandate in 2018. In all three countries, left-leaning parties have been in power for more than a decade. These recent defeats suggest the "pink tide" of left-wing governments in Latin America since the start of the 21st Century is receding. In Argentina, since 2003, Nestor Kirchner and subsequently his widow, Cristina Fernandez de Kirchner, led populist governments that owed much to the Peronist legacy. This included strong social programmes to relieve poverty and resistance to international economic orthodoxy promoted by the International Monetary Fund (IMF), but also led to strained relations with the country's agricultural and business sector. But the Peronist candidate in the 2015 contest, Daniel Scioli, was decisively beaten by Mr Macri in a run-off election at the end of November. In Venezuela, the arrival to power of Hugo Chavez at the end of the 1990s and the attempts to create a "21st Century socialism" led to an even greater polarisation of society, with many middle-class professionals leaving the country. But, for more than a decade, opposition voices in Argentina, Venezuela and Brazil proved unable to unite or convince a majority in their countries that they could offer a real political alternative. At the same time, the parties in power in all three countries have been accused of financial scandals and corruption, and of manipulating state institutions for their own political ends. The left-wing presidents have also suffered because they are all "second-generation" leaders of populist movements who proved far less charismatic or capable politicians than those who first swept to power more than a decade ago. Cristina Fernandez de Kirchner won popular sympathy in Argentina following the death of her husband, Nestor, in 2010, but proved to be far less adept at governing the country than he was. In Venezuela, Nicolas Maduro faced the hard task of continuing to build on Hugo Chavez's populist Bolivarian revolution. He too won the presidency thanks largely to a sympathy vote after Chavez's death in 2013, but has lacked both the charisma of his predecessor and the political nous to cope with increasing economic and social problems. And in Brazil, Dilma Rousseff has failed to measure up to the inspiring PT leadership of her mentor, Luiz Inacio Lula da Silva, who served two terms in office from 2003 to 2011. She now faces either being impeached, or leading a lame-duck government for the next two years. The positive aspect of the recent elections has been the willingness of the ruling parties in both Argentina and Venezuela to accept defeat. Despite Cristina Fernandez de Kirchner's obvious animosity towards Mr Macri, there was a smooth handover of power in December 2015, something that has been rare in Argentine politics over the past 50 years. And in Venezuela, President Maduro accepted what he termed "adverse results" in the elections. Image caption Nicolas Maduro accepted defeat and said "the constitution and democracy have triumphed"
Now his United Socialist Party will need to show it is not afraid of a large opposition majority in the Venezuelan National Assembly pushing for change, and does not resort to governing by decree. In Argentina, the Peronists still enjoy a majority in both houses of Congress. They also control the main trade unions, and remain the most powerful party, and are likely to make life difficult for the incoming president. President Macri leads a movement called Let's Change. This desire for fresh political ideas and policies seems likely to sweep throughout Latin America in the coming months and years, threatening the hold on power of other populist leaders such as Rafael Correa in Ecuador, Evo Morales in Bolivia, and Daniel Ortega in Nicaragua.